John Green's The Fault In Our Stars is one of those books that you feel you ought to read because so many people feel strongly about it. It's a love story about teenagers with cancer - the narrator, Hazel, has a terminal case, but new drugs have given her a fair few years longer than originally expected. In a church support group she doesn't actually think does her a huge amount of good, she meets Augustus, who's lost a leg to a cancer that's currently in remission. The two bond over a cancer memoir that Hazel feels is the only one to accurately reflect her own experience, and despite the constant care Hazel needs they resolve to go to Amsterdam and seek out its reclusive author. 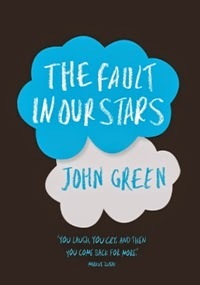 It's ironic that The Fault In Our Stars deals in part with a novel that's become a touchstone to its heroine, when the book itself has gone on to become so well-loved. It's quite moving but not overly sentimental and doesn't paint cancer patients as saints which may be why it's been as successful as it has; although of course the idealised love story is another reason it would have acquired so many fans.